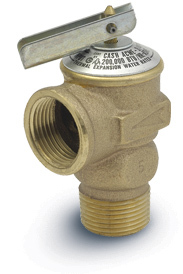 Cash Acme is a world leader in temperature & pressure (T&P) relief valves. 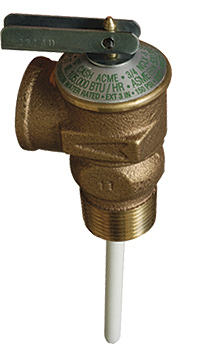 Used as a safety device on pressurized water heaters and cylinders, this Cash Acme line includes specialized ½" models and high capacity commercial products to 2". Cash Acme also has a complete range of pressure relief valves including ASME models for boiler application and models for a wide range of other applications. ASME Section IV listed and rated for emergency steam discharge. Bronze body, brass and/or stainless steel internal components, silicone seat disc and stainless steel spring. “Pop” type action provides maximum safety. F-30 set at 30 psi only. Iron body construction. Bronze body option available in some sizes. Brass seat, silicone seat disc and EP diaphragm. “Pop” type opening action. 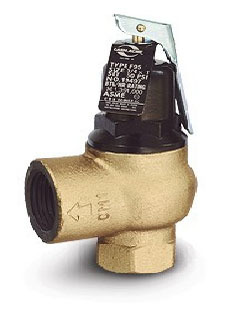 The F-95 Valve series offers a complete line of boiler safety relief valves in sizes ranging from 3/4" X 1" to 2" X 2-1/2". This complete range of sizes provides pressure protection for many commercial/industrial OEM boilers and hot water heating system applications. 30 to 75 psi pressure sets available. 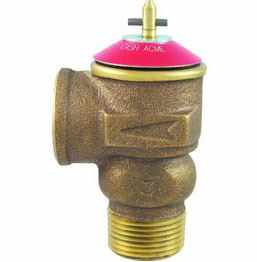 CSA design certified per ANSI Z21.22 Relief Valves for Hot Water Supply Systems. Bronze body, stainless steel spring, furnished with silicone seat disc and EP diaphragm, as well as a test lever. Standard factory setting is 150 psi. Temperature relief setting is 210°F (99°C). All FVX Series valves through 1-1/4" have coated thermal elements that protect against mineral build-up. 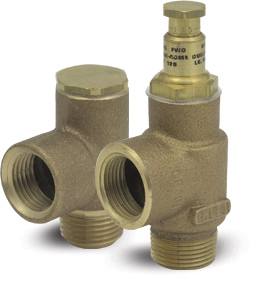 The 1-1/2" and 2" valves have stainless steel elements. Available with male or female inlet connections. Female outlet connections. 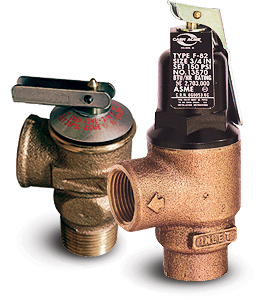 Small, low-cost relief valves suitable for static over-pressure protection. Type FWC incorporates a calibrated adjusting screw for occasional changes in pressure setting without the use of a pressure gauge. Bronze bodies with male inlet and female outlet, silicone seats and stainless steel spring. Standard factory set is 125 psi. Available set range for FW is 15 to 250 psi. FWC is 25 to 175 psi. Bronze body, brass and stainless steel internal parts, silicone seat disc, and stainless steel spring. Test lever is standard on the FWL-2. Male inlet and female outlet. Automatic reseating after pressure relief. Compact and economical. The FWOL is available without the lift lever. The NCLX incorporates an inert thermal element coating that provides effective isolation from mineral deposits (liming). Cast bronze body with male inlet and female outlet, brass and stainless steel internal parts, silicone seat disc and stainless steel spring. Test lever standard. Temperature relief setting is 210°F (99°C). Prevents internal vacuum conditions that could collapse storage tanks - especially copper. Bronze body with a male inlet, integral body seat and silicone seat disc. Maximum water pressure 200 psi. Maximum temperature 210°F (99°C). Capacity 13 SCFM at 2" Hg. Available with dust cover.